Ringworm is not really a worm at all--it's a skin disease caused by one of four different recognized species of fungi. It's characterized by circular lesions, or sores, which at one time were believed to be caused by a worm curling up in the tissue under the skin. The four species of fungi which can cause the disease known as "ringworm" in dogs can also infect humans. The fungi live on the surface of the skin and in the skin's follicles, and feed upon hair and dead skin tissue. They cause the hairs to break off at the skin line, resulting in round patches of hair loss. Once the fungus begins to multiply, the sores may spread all over the animal's body, and will begin to become irregularly shaped. The incubation period for ringworm is 10 to 12 days. It is highly recommended that you consult your veterinarian during this time. Take the infected pet to the veterinarian, who will most likely prescribe griseofulvin. This drug should be administered daily, and is in a tablet form. It's usually prescribed for 30 days, and must be given with fatty food, such as rich canned food or a few meat fat trimmings. The vet can also prescribe topical medications, although most are available over-the-counter. Visit your favorite pet specialty store. There are several topical antifungal medications available on the market. You should apply topical treatments to the pet's affected areas once a day for 10 to 14 days. Be sure not to get these medications in the pet's eyes. Popular topical treatments include miconazole cream, lotrimin cream and 1-percent chlorhexidine ointment. Shop for a 0.5-percent chlorhexidine shampoo, 2-percent miconazole shampoo or ketoconazole shampoo. Antifungal shampoo bathing should be performed every other day until the lesions have healed and the hair begins to grow back. Bathe the affected animal three times during each session with the solution. Bathe unaffected pets on the same schedule, but only once rather than three times. Lather up, and leave the lather in place for 5 minutes before you rinse. What you are actually doing is removing the ringworm spores from the hairs so that they don't drop back into your environment to expose the pets to the fungi all over again. Purchase lime sulfur dip. If it is not available at your pet store, you can order it online (see Resources). Perform lime sulfur dips twice per week for the first two weeks, and then once a week for four to six weeks. The lime sulfur dip should also be applied to any other cats and/or dogs in the home in order to prevent them from becoming infected, too. Always wear gloves when applying this dip. Although it is an effective treatment, it does have a nasty smell (like rotten eggs), and will stain fabrics, can cause temporary yellowing of white fur, and can tarnish your jewelry. Make sure you use this in a well-ventilated area. Mix lime sulfur dip according to the instructions. Add 4 oz. of the dip concentrate to a gallon of water. Shake it very well. Carefully pour the dip solution over the animal--don't get it in or near its eyes. Make sure you treat all affected areas. Do not rinse. Do not shampoo after applying the dip. Towel-dry your pet--do not blow dry. Don't let your pet ingest this stuff. Vacuum and steam clean all the carpets, rugs, drapes and fabric-upholstered furniture in the house. This will help to remove ringworm spores. Be sure to discard all vacuum bags immediately. Bleach any appropriate surface with a solution diluted 1 part to 10. This will kill 80 percent of fungal spores with a single application. Repeat the steps in the first two sections for the recommended length of time. Be persistent and patient, though, as results from treatment are not immediate. Actually, the infection will become worse before it gets better. The areas of hair loss will increase. But within a week or two, the hair loss should subside and there should be no new areas of hair loss. The crusty appearance that the skin has had should improve, with the skin beginning to look more normal. Confine affected pets in order to minimize exposure to other pets and family members during this time. 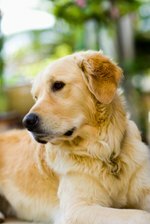 If aggressive treatment is maintained, infected pets should remain contagious for only about three weeks. Pronounce the aggressively treated animals as cured when treatment is completed and continued environmental decontamination has been successful. Although a "carrier" state may be in existence, it's usually because the treatment was not sustained for a long enough period, or was not aggressive enough, or perhaps there is the case of a compromised immune system due to some underlying disease.